MANCHESTER, England, May 4, 2010 (AFP) - Harry Redknapp is urging Tottenham Hotspur to put the English Premier League's top three on notice that their monopoly is over with victory over Manchester City at Eastlands on Wednesday. He wants his charges to prove his theory that the stranglehold on Champions League places and the battle for the title is no longer the right of just Manchester United, Chelsea and Arsenal. A win for Tottenham would secure them a fourth place finish at the expense of Roberto Mancini's men and a place in next season's Champions League for the first time in the club's history. But Redknapp is looking beyond the chances of joining European club football's elite and is convinced Tottenham have now closed the gap on the so-called "big three" at the top when it comes to challenging for major honours. Redknapp, who is hoping goalkeeper Heurelho Gomes (groin) and centre-half Ledley King (knee) will be passed fit to play, says Tottenham will continue to go about their quest quietly. "We've got closer to Arsenal this year, the points tell you that we're not a million miles away," the Londoner said. "Last week Arsene Wenger was saying they had to make sure they hung onto third place because it was getting close. We've closed the gap on all the top teams, I think. But we still have a way to go. We won't get too carried away. "This lot are the quietest lot of lads you've ever seen. It takes a lot to get them excited. They are very laid back and quiet. You've never met a quieter bunch. They're not going to be getting too excited about it all. "It's the way they are. The days of having a Tony Adams have gone, they are few and far between now. Everyone would love people like that. "If you went to Manchester City, apart from Craig Bellamy, they are all probably quiet there. It's the same everywhere." 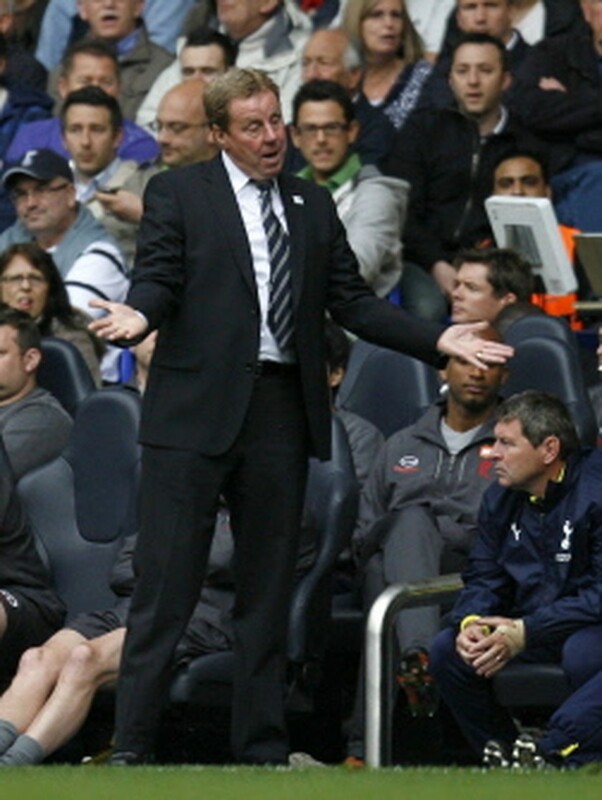 Redknapp admits he loves to watch his own side play and is expecting them to turn on the style. "I could watch Luka Modric play all day. I love watching him. I just think he's a pleasure to watch and that's why I do what I do. I love seeing him train, play and see what he can do," he said. "I love watching good players and we've got some good players. Tom Huddlestone is a great passer of the ball. "If we were a team that just kicked it up the pitch I wouldn't bother. But I enjoy the way we play. They're as good as I've seen when they move the ball about. "We had a one-touch session and it was fantastic. They zipped the ball about, and you have to be a good player to do that, you have to have awareness of where the ball will run, your touch has to be fantastic. They were brilliant. "City have been dangerous though. They have good players. They are always going to be a threat with a forward line of Adam Johnson, Carlos Tevez, Bellamy and Emmanuel Adebayor. "That is a real potent forward line, but we have good forwards too and can cause them problems, hopefully." This could prove to be Mancini's moment of destiny. The former Inter Milan boss was drafted in to replace Mark Hughes and handed instructions to lead City into the Champions League. But despite keeping his side in the hunt for fourth place, Mancini's long term future is far from secure and should he fail then further question marks will be raised. The significance is not lost on the Italian, who is confident his players can get the win they so badly want and has urged home supporters to play their part to the full. "We need our fans to be the twelfth, thirteenth and fourteenth man," he said. "Our supporters have been fantastic and we need them to get behind the team from the first minute to the last. "This is like a cup final for us. We wanted one and now we've got one. We have good confidence after beating Aston Villa and now we must focus and concentrate on getting the same result against Tottenham. They are a good side and it should be an exciting game."